Did you know that 9 out of 10 homes in the U.S. are under-insulated*? Take the first step and learn how to measure your attic insulation level today! 1. Measure. Go up to your attic and measure your insulation levels to see if you have a problem -- watch our video below to learn how. 2. Get solutions. Learn ways to improve the energy efficiency of your home with advice from EPA experts on how to seal and insulate your attic. 3. Fix and save. Take steps to fix your attic insulation level by hiring a contractor or DIY. Watch more how to videos about sealing and insulating with ENERGY STAR here. Saving money is just one of the benefits. Learn how much more attic insulation you may need. Read EPA's blog for advice on finding an insulation contractor. Not all insulation is created equal. 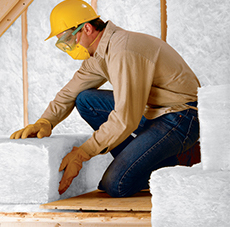 ENERGY STAR certified insulation is third party verified. Considering an attic sealing project? This page is for you. Use this page to guide your next attic insulation project. Free outreach materials for stakeholders and contractors.